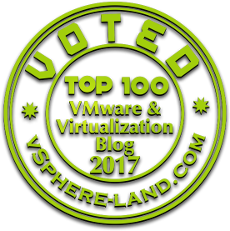 While delivering VMware vSphere classes i got this question many times where in my audience is interested to know what are the Design Qualifiers for a Good VMware vSphere Design or what are the factors that affects a design. So let's begin with Answering the first Question whether it's a Product Oriented Design or Solution Solution Oriented Design ! What's the Difference ? In a Product Specific Design the success is measured based on the performance of the product and it is less tailored towards the Organization Needs, wherein a Solution Oriented Design success is measure how well the Design is achieving the Goals of an Organization because it's tailored uniquely based on the Organization Requirements. Based on the above types Design Documentation may vary as there is a less documentation in a Product Specific Design compared to a Solution Oriented Design. True methodology towards a Good Design is to understand that Designing is an iterative process and a lot of Phase, Interviews with stakeholders and Documentation are involved during a Design Phase. 1 - Assessment- The First and the most crucial stage which involves defining scope of the Project, understanding the business and technical requirements. Assessment phase also help us understand the Current State Analysis Report (Total amount of Physical Servers available to Virtualize, Total Amount of CPU and RAM available, Average/Peak CPU and Memory Utilization.) which has been gathered from capacity planning tools tools. 2 - Design- It's time to proceed further with the designing stage first we will be creating a Conceptual Design which is a high level overview and has all the information gathered from the Current State Analysis Report, the technical requirements and the Business requirements with further classifications into (Business Requirements ,Constraints, Assumptions and Risks). Constraints are the boundaries within which the Design should be laid, it could be an Organization Policy or could be a Budget Restriction. Assumptions are the expectations about the implementation of a project which are believed to be true and cannot be confirmed during the assessment and design stage. For example one common assumption is that the support staff are trained on the Virtualization technologies or the Client will provide all the License required for the implementation of the Project, or could be that Application team will help with all the test plans necessary for the implementation of the project. Risks are directly proportional to the Business Requirements, Assumptions and Constraints and Risks need to be properly documented with it's priority and the recommendations needs to be provided to avoid that Risks. For example while proceeding with the Business Requirements during the Assessment Phase the Client said that they may include some more requirements during the implementation of the Design,now this expectation in making architectural changes in the middle of the project will impact the design and should be properly documented as one of the Risks and the impact should be communicated well in advance to the StakeHolders. Once the Conceptual design is in place it's time to move forward and create a Logical Design which includes Design Decisions on how to arrange all the infrastructure components so as the business requirements can be satisfied as mentioned in the Conceptual Design, Typically a Logical Design includes Design Decisions for Management, Clusters, Networking, Storage,Virtual Machines and Security. Ok So what's Next? It's time to Create a Physical Design with all the information i have Gathered from Logical Design and Conceptual Design. Physical Design is based on Logical Design with a good logical Design we can create one or more Physical Designs. And it includes all the minute details including the specifications about the Hardware, the ESXi version, vCenter Version, vCenter (Windows, Appliance),IP addresses, SSO details, Domain Name, Admin users. 3 - Deploy as the name suggests Deploy stage is that stage where in we build and Configure the Environment based on all the Requirements we have gathered in the above phases and this is the stage for which we have been waiting for a long and busy doing all the documentation and interviews with various stake holders. 4 - Validate stage is the last stage wherein various tests are conducted to verify that solution is built as per the Design and also to check if the solution behave as required, this is the phase where the end users learn about the operation about the implemented Solution. Now when we are aware about the design process and the various phases involved during the design it's time to Answer the Original Question What are the Design Qualifiers ? 1 ) Availability- A design which is available is also reliable as it helps in eliminating all single points of failure and implementing the mechanisms to quickly restore the services if in case a failure occurs. Common Mechanism to to measure Availability is Class of Nines which refers to the number of nines in a percentage of time the System is available for example if system is available for 90 % of time it's called Class One and if the System is available for 99.999 % of time it's called Class Five. One easy to use calculator is available at uptime.is which can help you calculate the SLA levels. 2) Manageability - The Design should be easy to Deploy, Manage, Administer, Upgrade and should be simple enough so as it would be easy to understand, easier to explain and easier to expand based on the future growths. 3) Performance - A Design performs well if it is able to provide the required amount of work using a minimum amount of time, SLA's has a direct relationship with the amount of work to be done,the time required and the resources to be used. 4) Recoverability - Infrastructure should be recoverable from any type of outage, the method chose to recover can be through backup methodologies or making use of disaster recovery process. 5) Security - Design can only be called a good Design if it minimizes the security risks,is free from Vulnerabilities and doesn't have unnecessary complexities.In short we are looking for multiple layer of protection in the design the more the number of layers the more secure is the environment.